I’ve been struggling to write this post for a few weeks now. Ever since I learned that I passed the bar exam in my state, I have been struggling with how to write about it. How to reconcile it to what I’ve believed about myself for so long and more than anything deciding what to do with myself now. This picture jumped out at me as I was trying to find a way to describe how I felt about taking the bar exam again. Taking the exam, while not the most important thing in the world, is a monumental and scary rite of passage. I was being asked to cross a chasm separating two immense mountains. The first is the mountain of my experience as a student. I had faced failure, faced success and conquered it all. The other mountain was the mountain of my profession. Several have crossed this path before. It shouldn’t be that hard…but the fall is so great if you’re unsuccessful that it’s daunting to even consider reaching that mountain. And that path, a tiny bridge between two worlds so similar but so very different looks as if the moment you step upon it, you’ll plummet to your doom. The first time I took the bar exam I was full of confusion, hatred for the path and resentment. I fell and I fell hard. I didn’t pass the first time. I have used tons of excuses over the years to explain why I fell (“I was pregnant at the time”, “I was buying a house”), but the honest reason is I wasn’t sure I wanted to be on that mountain. After I fell, after I gave birth, I climbed back up to that precipice to try once more. But again, I lacked commitment and purpose (yes, even I lacked purpose). I allowed myself to become distracted and in truth I did a lot to sabotage myself because the same month I was supposed to take the exam is the same month my husband and I became polyamorous. Looking back on it, I can see why I fell, why I failed the bar that year. But nevertheless I was in that chasm dividing these two mountains. Instead of climbing back up to the crossroad, I stayed in the canyon and I wandered. I don’t regret at all the people I met along the way (okay, maybe I regret one person) or the choice to be polyamorous. I learned more about myself and my spirituality than I could ever have had I passed the bar exam the first or second time. I wandered away from the crossing point and tried climbing the professional mountain on my own but could never get as high as I wanted or felt I should. But the reality was I found ways to keep myself down in the pit, in the chasm of my own failure. I felt it is what I deserved and so I remained locked in positions where there was no advancement or recognition. I chose this fate. I would stare up at the heights I thought I could be at and convinced myself that I didn’t deserve to be up there because I couldn’t make it there through effort alone. I had to be one of the lucky few who could cross unassisted on the bridge between the divide. It wasn’t until a friend told me that my voice, my presence is missing from the hundreds of thousands who inhabit the professional mountain that I even thought to try once more. I looked up at where I needed to get to in order to even try to cross again. If I was going to do this again, I had to do it right. I had to take the right tools with me, I had to leave the nonsense behind. I shored up support from the people I knew, the people I knew who could honor what it was that I was trying to accomplish and not try to pull me off course with their own issues. As I embarked on the climb, I noticed the markers along the way. The pieces of advice I had shunned before because I had been so unsure of myself. I retained more and trained more along the way, noting that this wasn’t just a journey to get to the bridge to cross, but a journey to learn how to cross. Climbing the mountain itself without noticing all the signs others had left behind would never prepare me to cross. And one of those signs was a strong lesson in trusting yourself. Trusting your knowledge of your own self..your triggers, your burdens, your style of learning in order to hone yourself for the crossing. Despite all my preparation (more than 500 hours of studying), I encountered a massive obstacle, something that threatened to curtail everything I had been working for. Instead of letting it halt me…I stayed with it. Picked my way around it and took only what I absolutely needed, including time to relax and chill out. By the time I reached the threshhold of the bridge, I was as ready as I’d ever be. I had to trust myself. 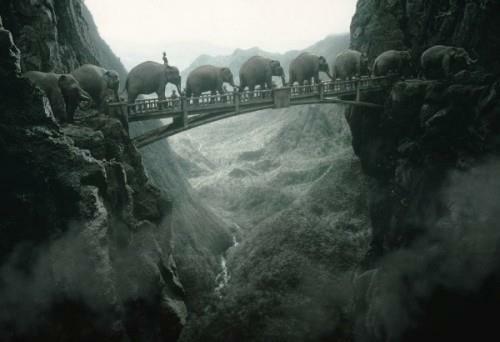 A few weeks before I started preparing for the bar exam, I had a vision of five gold elephants crossing my path. Each elephant represented a wound that would be healed this year and the wisdom and compassion I would gain from it. It’s another reason why I chose this photo, it reminds me so much of this presence that was with me at all times. I still keep 5 forms of an elephant on my desk at all times to remind me of the spirit of overcoming so much self-loathing, self-pity, anger and frustration to get where I am now. But the lesson is I still have to trust myself. Now that i’m an attorney, I’m confronted with all sorts of questions about how I want to define my life. I’m not on the professional mountain…I reached that destination and decided I valued the valley for everything it has taught me. But what I don’t want any longer is the constant fear of failure, the hurt I imposed on myself to punish myself for the failures I’ve already had. What I don’t want anymore is to question myself, to talk myself out of what I want or need. I have pulled off something that is scary and amazing all at once. Now that I have a whole wide world of opportunity open to me, what will I do with it? Will I grasp it and climb more mountains? Will I settle in one specific place and stay there the rest of my life (like most of my kind do)? Will I help others achieve the same heights if not more? The whole wide world is open to me…not just professionally but personally as well. And the next step needs to be taken with the trust I am constantly rebuilding within myself. Posted on October 29, 2012, in Calling, Queen Archetype, Real Life and tagged big topics, character, confidence, inspiration, Liberation, Real Life, wishes. Bookmark the permalink. Leave a comment.